Urban Street Ventures, Inc. is a verticaly integrated operator that specializes in cash transactions involving Southern California real estate. 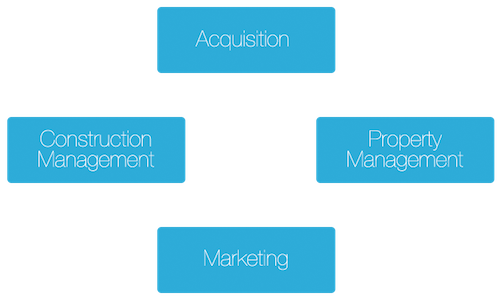 Urban Street utilizes their expertise in acquisition, construction management, property management and marketing to maximize the value of each asset purchased. Their experience and street-tested systems have proven effective in managing assets scattered geographically across Southern California. Immediately after acquiring title, the construction management team oversees the contractors & vendors involved in the renovation of assets. We are experienced in handling all types of rehabilitiation. After construction is complete, the marketing of the property is handled in-house. Properties are selected which can deliver both income and appreciation over a 2-5 year time horizon. After acquiring title, assets are renovated to rent-ready status. Our property management division handles the marketing, tenant selection, rent collection, notices and evictions. We start with an initial walkthrough with the contractor and our field personnel to obtain a job estimate. A second review by our in office analyst determines the proper scope of work. Field personnel walk the property several times during construction to ensure an on-time, quality delivery. We have seasoned professionals who exercise oversight in the construction planning, budgeting and execution process. These individuals maximize quality control as well as manage budgets, change orders, scheduling and related facets of the construction process. This is my second transaction with Robert and his team at Urban Street Ventures, Inc. I am extremely impressed by the way Robert and his team conduct business as all agreements are honored and everything runs according to the agreed timeline. The team is very professional and a true pleasure to work with. Special mention goes to Gabrielle who is nothing but amazing! Urban Street Ventures, Inc. is my first choice by far when it comes to investment properties. Great Organization, Staff was professional, from Administrative to Escrow, **Special shout out to Robert, Randa and Gabriel. Thank you for Giving YoRealty Group the opportunity to service, this RE investment!! Look SOOO forward to working consistently with Urban Street. Would Not hesitate to refer your listing to any of clientele. Awesome experience. Robert and his staff were amazing to work with. We closed on time, no issues and no surprises! A professional, honest company that delivered as promised. Thank you Urban Street Ventures!!! Robert Compean was one of the most professional investors I have ever met. He is honest, down to earth and has a wonderful office crew that was very responsive. I will gladly call him with any listings that may pencil out for him. Urban Street Ventures is my go to company. Robert is a man of his word, and I can't say that about most investors! The escrow went smoothly. Working with Robert at Urban Street Ventures, Inc. has been an absolute pleasure. He is honest and stands by his word. If he says he will do it, HE DOES. I hope to work with him and his team again. Urban Street Ventures and staff were such a pleasure to work with. It's refreshing to find a company that is professional, dependable and understands the importance of communication. 5 Star Service!! Highly recommend. Urban Street Ventures or Urban Street Properties is an extremely unprofessional management company. The location of their main office is too far from their properties which led to miscommunication and a disconnect from the tenants. This was shown by the vendors that were sent to do repairs/maintenance who were unreliable and unprofessional. And as I stated before, the management company was too far away to manage the property which allowed other tenants to disobey the rules and policies of lease agreement. Which extremely was frustrating to the tenants like my husband and I, who abided by the rules and policies of the lease agreement. Since 1996, Urban Street Ventures, Inc. has been actively acquiring value-add real estate in urban locations. After taking ownership, repositioning strategies are implemented to unlock each property’s value potential. We take pride in improving neighborhoods by transforming under performing and neglected properties into productive uses.